If you liked the brooch we featured in yesterday's Casual Cool outfit set, then you'll love this exclusive offer for Hijab Style readers! Pinz Pinz Pinz is a UK-based website that sells all manner of beautiful pins and brooches at bargain prices. 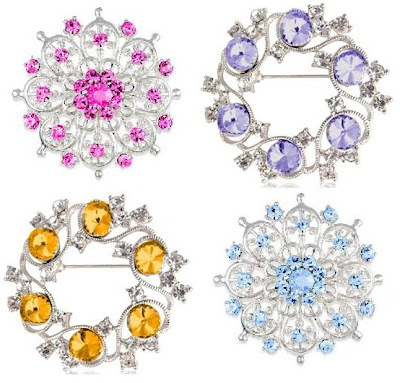 You can receive a FREE Sunshine brooch or Gem brooch when you spend £12 or more on the website. Just enter "Hijab Style blogspot" into the comment box along with your choice of brooch when you place your order. The offer is valid until March 3rd 2010. Those are sooo pretty! Thanks for sharing! Assalaamu alaikum - I am trying to order on the site and used this code but it seems to still be charging me for the extra brooch?? Anon, don't add the brooch to your cart, just enter "Hijab Style blogspot" along with the name of your choice of brooch into the comment box when you place your order. Have ordered mine - now waiting for it to arrive!! I've ordered some pins. The problem is that they don't have a contact telephone number. I ordered mine on 24 February and haven't received mine yet. I've been in contact with the store owner and aparently my payment was taken but the details of the order were lost. Hopefully it will be resolved soon, but that is something which is quite annoying.